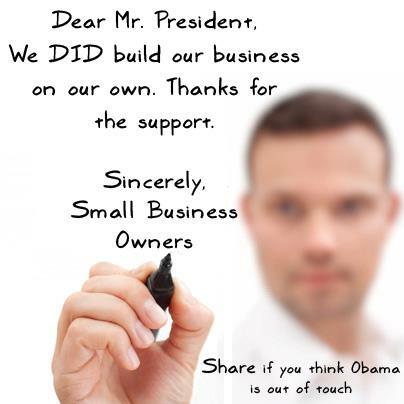 I Am Offended by Obama’s ‘You Didn’t Build That Business’ Comment | Virginia Right! Shortly before the November election, I will celebrate the completion of 10 years in business as the President and Owner of an Insurance Agency. One that my wife and I have built with our own sweat and long, hard hours chained to a desk with almost no time off. In July of 2002, almost exactly 10 years ago today, I was notified while on vacation in Orlando Florida that I was being laid off, a victim of the total collapse of the tech sector. I have spent most of my time after leaving the Navy working on and learning computers and both voice and data communications. I have always taken pride in the fact that I was able to make a living doing something that was also my hobby. Few people are actually able to say that. 9/11 had something to do with the loss of my job, but I believe the most devastating blow was also the most profitable aspect of the technical sector. Y2K. Remember the “bug” that had everyone afraid that ATM’s would quit working and planes would fall from the sky? Well, every company and individual upgraded everything they owned with a plug in the last couple of years of the 1990’s. So on January 1, 2000 everybody just stopped buying. Boom. Totally flat. Real Estate did well as did some other aspects of the economy. But everything from Digital Stores to Dot Coms all went belly up. I managed to hold on for a bit over a year and a half, but it was obvious that it would be a while before people were ready to buy new computers. They already updated everything. I got a severance package, but that was only going to last a few months. I had to find something fast. After a month or so, it became painfully obvious that I was not going to find anything very quickly and decided to take things into my own hands. I decided to open an Insurance Agency. I had no experience in insurance in my life prior to that time, but it was an opportunity I believed I could handle. Between the end of August, 2002 and November 2002, I had to learn insurance, pass the test – which is no easy task – and somehow find a location, furnish it and make money. And money was something that was in short supply, being unemployed and all. No problem, right? There is plenty of assistance for people wanting to start up a business isn’t there? Obama said so! Well, no. The Small Business Association was not interested. My bank was not interested and the dozen or so other banks I spoke with were not interested in helping me get off the ground. In the end, I had to do what almost every other entrepreneur is forced to do. I had to get an equity line on my house to open a business that would, hopefully, not only pay back my equity but provide enough income to support me, my wife and our two kids. The government was absolutely no help. In fact, the biggest obstacle I had to overcome was the government. Federal, State and Local government folks all came by with their hand out. Insurance licenses, business licenses, inspections, rules, regulations, and hurdle after hurdle. I can honestly say that I do not owe one drop of gratitude to the government Obama believes is responsible for my success. I have done something most new businesses don’t do – survived for 10 years – even under this horrific Obama economy. There is one thing that I am sure of, though. If I was forced to start this process all over today, I would not be willing to risk my house in the economy that Obama has built and I would have been afraid to hire a single employee. I am still the president of the agency, but my wife, who has every bit as much invested in this venture as I do, maybe more, is running the office day to day. I begin every day at 5:00 AM and spend at least 90 minutes doing the preparatory work for the day, and I give my wife a break on Saturdays and work that one day per week. But each morning after I do the prep work for the agency, I head out to my IT job that I have had for the last 5 years. You see, the government did not help with my health insurance (I sell mostly Auto Insurance) and I had to pay a lot to keep coverage. And it was very hard to make those payments every month. But I didn’t go whining to the government and demand that someone else pay for my medical care. I found a job that provides health insurance and also happens to be the type of job I love. No, Mr. Obama. I don’t own my success to you or to the government. I owe my success to an attitude that I can do for myself. I don’t need government to help me and neither did most of the small business owners across America today. My story is not unique, it is the norm for entrepreneurs. I have survived unemployment, I survived the lack of anyone willing to loan me the money I needed to start my business and I managed to overcome the roadblocks that were in place to slow my progress. But I am one of those “old school” people who were taught that hard work pays off. That depending on government or the kindness of others is a losing bet. My wife and I both put in at least 80 house every week between the two businesses and I still find time to do everything I can to get you and your lazy “America is Unfair” attitude out of our White House. I would love to expand my insurance business. I would love to hire more people. But as long as the best you can do is tell me I should be thankful for the government that built my business, I will continue to do everything I possible can to elect someone to the White House that understands work ethic. Someone who believes in the American people and not in the American government. I don’t want a handout from the government. I want the government to get the hell out of my way so I can prosper. Sometimes I feel like I am trying to make a difficult three point shot to win and you are the point guard in my face doing everything you can to make me miss. It is so painfully obvious you are not on my team and not on the team of businesses. And the really sad thing is, if you would either work with us, or better yet, get out of the way, the economy would recover and unemployment would drop like a stone. No, Mr. Obama. You are due no gratitude for my business. You wouldn’t make it a week doing what I do. You are too dependent on others. I am a retired architect, contractor and software developer. I put myself through college by working all night pushing pizza and beer and by taking out a small student loan. I repaid the note with interest within two years of graduation with after tax dollars I earned by working a second job. I had no Pell grants nor do I EVER recall getting a call from my state or federal government voicing any concern with my well-being or to offer me any assistance in becoming a productive member of society. I did get interest due notices and demands for taxes on the minimum wages I earned. I also got a draft notice that demanded I serve this same government. My father, and his five brothers fought across Europe and into Germany, and across the Pacific into Tokyo in WWII. My grandfathers, great-grandfathers and great uncles on both sides of my family served our country for generations and in every war and conflict since well before the American Revolution. I did the same for eight years for minimum wages on which I paid taxes. Like my ancestors, I served with pride. But I was paid below pauper’s wages, was told when and where to eat, sleep, work, play and fight. I was never used to my highest potential. I was a G.I…”government issue” and as such, held to be and treated as government property. I loved my time in the military, but I have a pretty good idea how a government-run health care system will look in short order. I sat for my first architectural license in 1976 and passed it the first time. Not once, as I studied for months for a three-day test, did I get a call from my government asking if I needed anything to help me succeed. I did, however, get several bills from the government I had to pay for the privilege of taking my boards and, then, for the privilege of practicing at my own risk. I paid the bills…with after tax dollars. I eventually became a decent architect, but I soon discovered the business of the profession to be just as compelling and challenging. In 1981 I leapt into ownership of my practice and learned the thrill of surviving while my government taxed my every move and threw up every possible obstacle to successful outcome by way of OSHA, EPA, the Americans with Disabilities Act, excessive and endless paperwork and ever increasing and insidious demands for more taxes, fees, penalties, filing costs, the list, as you well know, is endless and growing exponentially. Not one time in my entire practice or my business career, did I get a call from a government official wanting to know how he might help me BUILD my practice or my businesses. I did get audited however, and regularly. But I never got a single fine or penalty. Probably because I spent millions of dollars on legal and financial experts to make sure we were always in compliance. During my career I started up a professional practice that grew from four employees in 1984 to six hundred and fifty by 1994. Do the math sometime and figure out how much a $5M monthly payroll generates in terms of city, state and federal taxes. Then multiply that times 250 plus. Calculate how much was paid into FICA accounts on behalf of employees. Then guess how many homes and cars were purchased by employees with after-tax dollars. How many groceries, utility bills, gas purchases and other items were bought with those after tax dollars. Then calculate the sales taxes, use taxes, interstate commerce taxes, et al. were then sent on to government coffers yet again by my employees. A little bitty part of a great big number, is still a great big number! And a little bitty number repeated often enough, is an astronomical number! On top of my practice, I founded several other businesses. A construction company. An environmental goods and services company. A solar energy company. A real estate and enterprise management software company. Not once do I ever recall getting a call from a government official wanting to lend money, share in the risk or assist me in any way towards success. I did, however, pay the government fees that allowed me to start them. I made regular quarterly PRE-payments of taxes, often long before my clients actually decided to pay their bills. And if I had to borrow money to pay the taxes, no quarter was ever shown by the IRS. Borrow, steal, pay interest on top of taxes, pay fines and penalties for paying one day late…no matter. Caesar demanded his due. During my practice we designed and oversaw construction on over 10,000 projects throughout the western hemisphere. When you calculate the land deals, bank financing, engineering, construction, materials, suppliers, raw and manufactured products, equipment, steel, concrete and every trade involved in this amount of real estate development over time, the number of dollars turned, and the resulting tax dollars generated, is staggering. During all this time, not once did I get a call from a government official asking me if he could help make payroll. I got no calls wanting to know if new roads, utility extensions or technologies were needed to make it all happen. I don’t recall a single instance where the federal government signed next to my signature to personally guarantee a building lease, a computer network purchase, a new phone system or for the furnishings required to outfit a branch office. I did get an ever-expanding, exponentially complicated tax system to comply with. The more successful we became, the more intently the IRS inserted itself into our daily business to see how much more they might skim off the top. For twenty-seven year, three months and 28 days, and for 725 plus payrolls, I worked to feed the two beasts. The first was my business, the second was my government. One of them contributed to my well-being, the other impeded it. I will leave you to guess which was which. Over the first eight months of 2008 we hit an ever higher wave of unpaid client bills and borrowing to keep the businesses alive. Long time, solid clients who never missed an invoice for years suddenly had their operations and project financing disappear, dry up and turn to dust. Only late in that year did we begin to see what was the driving force behind all this. Eventually this rising tide swamped my firm. In the ensuing bankruptcy I lost my firm, my career, my reputation, my life savings, nearly all my friends, even some family and I became a pariah to all those I had fed, housed and clothed for so many years. I learned that once you stop being the meal ticket, you quickly become the meal. Not once during this traumatic turn of events did I get a call from any of my government “partners” to lend a hand or to console me or my people. I got no offers for an interest-free government bailout to perhaps allow the hundreds of millions in taxes I paid in over the years to come to my aid during a downturn. I did get demands from the IRS. I did get audited and again passed muster. I guess I do have to give credit where credit is due. I filed for unemployment benefits. I paid the maximum amount into FICA annually for nearly thirty years. Do the math. My benefits? $400 a week for 20 weeks. And every week I had to phone in and run the beggar’s gauntlet set up by our benevolent brothers in government that treats the taxpayer like a convicted felon out to rob the coffers blind. Oh, and the final insult to injury…I had to pay taxes on those benefits, just like I now have to do with my social security benefits. Don’t even get me started on that issue. I am asked why I don’t start another practice or found another start-up. My answer is always the same…because I choose not to. I choose not to dance the dance. Taxes and government compliance used to be a nagging hassle, but it was bearable. But we now have an avowed socialist in the White House. No one with any life experience, any business experience, and sense of personal responsibility for his own life, can look upon this man-child’s performance, his public statements, his actions over the past four years and deny this to be true. Some say it is mere incompetence, inexperience and ignorance. In dealing with thousands of people during my career I can say without reservation that there are only two possibilities to explain someone’s behavior. It is either that he doesn’t know what he is doing, or worse,…he know’s exactly what he is doing. This president is intentionally, systematically knocking out the piers that support the foundations of our county, our culture and our Constitution. Reagan did it to the USSR by driving them into bankruptcy with Star Wars. This man is doing the same thing to our country with his own version of Hollywood Star Wars, a country he despises, because he knows he cannot overcome the system in place, therefore he has to cause it to collapse of its own weight. When finally comes complete economic, cultural and societal collapse, the people will fall on their knees at the feet of a messiah claiming the power to save them all. That day is coming and this man is invested in his messianic complex. A second term by this impostor will ensure it sooner than later. My login name states my position today. I am John Galt’s Motor. I invented my motor. I built it. I risked it failing. I did it alone. I did it for myself. I hired and paid top wages and benefits to all those I needed to pull it off. I paid off the government to keep them at bay long enough to do it. I met every gauntlet they threw down. I rose above it. I worked hard. I worried alone. I sacrificed. I pulled it into the stratosphere of performance and I rode it into the ground…alone! And now… I quit. I will ask no man to sacrifice himself in order that I might live. Neither will I sacrifice myself to or for those parasites who would demand my life’s blood that they might live in comfort, free of individual responsibility and personal effort. Ayn Rand’s words are stamped on my heart and soul. To the last man out, please turn off the lights. By the time you leave, there should only be one or two left burning. Outstanding story. Very compelling. One problem. Your anger is misplaced. Obama or no Obama. It really does not matter. He could not make it worse or better even if he want it to. Yes, he needs permission. Like any Incorporation CEO does what is tolled by the Board. That is what he is hired for. There is no difference in USA Inc. Politics is a show no more or less. It is a side show. Obama did not change the system. He inherited it. Find ouy who dr. Edwards Daming is. Read it. This is what he says about the systems. Systems can not be adjusted and should not be plaid with. If, you move one thing everything else will change. Who moved the jobs to Asia????!!! Who deregulated banking system? All other points are mute. You have changed few main elements and all of the suddenly the whole system is collapsing. Read, learn and say thank you. Do not be angry is not good for your hearth. Nice story, good effort, wrong understanding. What you do not know is a fact that you could not accomplish same results in any other country outside of USA Inc. The difference is something independent of you. So what is it? Environment, economical environment. This economical climate is changing fast for variety of reasons: mostly, standard of living going down like a rock. You will go with it in spite of your efforts. In insurance business there will be a delay but do not be delusional it will go down. What Obama is doing is trying very hard to stabilize the standard of living for all of us. It is a class warfare. No buts about it. If, he will be successful your business will stay put assuming all other factors being equal. So, as you can clearly imagine it is not what you think. You are a proud man, but do not be delusional without that climate you would not be where you are today. You should be thankful for the system that have allowed you to succeed. One way of doing it is to pay your share in taxes. Poor are poor because did not know how to take advantage, how to use the system. For the same token they do not owe it as much as those who are very successful. Not to mention, they do not have it. Someone has to pay. However, if you stick to wrong principles pay less now, let the standards of living go down, than there will definitely be lesser profit later on. You can not have it both ways or as they say “have a cake and eat it too”. Think again: you owe it just like any one of us including the most reach and/or affluent. Also, those who are benefited the most must pay most. Simple 101 Economics. Any other way is gimmicks and stupidity. I can see you have never taken the risk of getting an equity line on your home to start a business. This is a tremendous risk of my most valuable tangible asset. And of course one could do the same thing in other countries. Just not the ones that have become Socialist like Mr. Obama. And you have a basic lack of understanding about running a business. You seem to share that with Obama as he has never run a business either. Business either make money or close down. It’s that simple. Most businesses have ups and downs. And for your information, the last few years under Obama have been hard. Harder than it should be. The system did not “allow” me to succeed. I succeeded in spite of the system. See, for the last few decades the government has been asking those who have money to “pay their fare share” or “pay just a little more”. That “little” has become so massive that 50% of Americans now pay no income tax at all, and a good number of them get “refunds” on taxes they never paid. They are taking the money from me and giving it to others to sit on their butts and do nothing. Nothing but vote for the party that promises to keep sending them a welfare check. We have paid “a little bit more” so many times that people like you think it is OK to live off of others. That because I worked for years buying a house and finally managed to scrape together enough equity to start a business I should allow lazy freeloaders to live off of my risk and sweat? No. I am busy trying to make a living. When I lost my job, I didn’t go running to the government admitting defeat like Obama wants people to do. I mortgaged my property and started something from scratch, knowing that if I failed, I wouldn’t have a house to live in. What I had worked and scrimped and saved to buy for 25 years was on the line. And half of the people in this country think I owe them a free ride? Hell no! That is the plan Obama has for America. What you don’t realize is that eventually Obama will run out of other people’s money and the welfare checks will stop. The Social Security and Medicare payments will stop. If other people had my work ethic and the government actually encouraged people to work, everyone’s standard of living goes up. I will not accept a nation of moochers living off of the work of the few. We the People have been without a Lawful Congress since March 27, 1861. What we have is a “de facto” corporation running the country, convened under the Executive branch by Lincoln April 15, 1861 (EO1). And We the People are the “Enemy” (1933) of the “de facto” corporation. are especially well written regarding this subject. P.S. All that talk about “debt” LIES, LIES, and MORE LIES!!!! The following was not written by me, but it sums up the situation. The District of Columbia (The District) has created adhesion contracts (i.e. birth certificate, drivers license, voter registration, passports, 1040, etc. ), and has kept their true purpose a secret. All paper created by “The District” are contracts, they NEED a signature, this makes the signer “liable’ for “The District” debt. These “hidden” contracts are what make you “subject to” “The District’ rules and regulations as YOU just signed and made yourself surety http://en.wikipedia.org/wiki/Surety. The Federal Reserve is an unconstitutional private company that our public servants (1913) put in charge of creating the country’s currency. The bankers got paid in gold, the public servants got the paper to spend and now didn’t have to go directly to the people. When the public servants ran out of gold (1933-Executive Order6102) they started using (and continue to use) “We the People” as collateral. (Research!!). The elected officials continue to allow the FED to exist. It makes it easier for them to spend other peoples’ money without being accountable. The collection arm of this private company (Federal Reserve) is the IRS. What, you think the bankers would trust the public servants with collection? The politicians will NEVER End the Fed! It is their sanctioned creation and useful cover. So what to do? Educate Yourself. (the books above are a good place to start LG). Stop the transfusion, and DEFUND “The District”. Know the difference between “lawful” and “legal”. A population cannot be “ignorant and free”. The legal definitions of ‘sui juris’, ‘propria persona’, and “pro se”, and what “District” Contracts you have unwittingly signed. Know who you are “at Law”, that Contract Law is the ONLY law of the courts and get out from under “The District”. BHO just opened the door to his inner feelings about the United States and business. He opened the door himself, so his Marxist/Communist beliefs are fair game. Fire At Will. Do your research on his slogan “Forward”. It is and always has been a Communist slogan. Fire At Will. BHO’s mentor was Frank Marshall Davis a FBI tracked and indexed Communist. BHO used to drink with him and smoke dope with him. BHO has said “what a great thinking mind.” Fire At Will. Point missed entirely due to basic bias against Obama. He did NOT say that business owners did not build their businesses. Stop looking at Fox news edits and listen to the speech in context. He said that even though people work hard to create their businesses, it is never a one man job. Successful businesses exist because of a framework that generates opportunity for them to work. In the US, moreso than any other country, there is an environment that fosters opportunity, and that environment is the result of numerous factors, not merely the sweat equity of the business owner. Even if someone borrows money for college or for a business start up, that loan is someone else’s money. Goods are transported to and from the business over the highways that are built by taxpayer dollars. This is what the President said, however inartful it may have been. It is disengenuous to claim that he is dismissive of business owners, business startups, and the hard work of entrepreneurs. Solutions are not reached when people disregard the facts to blow up bias and bigotry to further their own purposes, and that is what has happened with this issue. 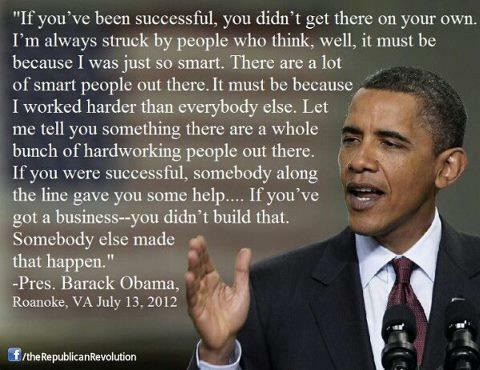 I am respectful of those who drive themselves to success, but I agree totally with the President. No matter how hard any one individual works, the environment for success in the US is part of that success. If you don’t think so, go start a business in another part of the world and compare business startup environments, governmental regulation, required bribes, payoffs, and tariffs. Go to my Facebook Page: http://www.facebook.com/IBuiltIt and post YOUR story of how YOU BUILT IT! Dude. . .Bravo, Bravo, Bravo! “Standing Ovation”. . I have heard Obama’s whole speech. . Its Rude,insensitive, and morally irresponsible. . Im in college right now to be Nurse Practioner who opens his own practice . .and thus far thru the college years. . Ive worked for every bit of it. . and when i graduate. . Ill be doing that ON MY OWN AS WELL. The government and Obama thus far has been a study partner with me or paid for my classes. I would love to expand my insurance business. I would love to hire more people. But as long as the best you can do is tell me I should be thankful for the government that built my business, I will continue to do everything I possible can to elect someone to the White House that understands work ethic. Someone who believes in the American people and not in the American government. I don’t want a handout from the government. I want the government to get the hell out of my way so I can prosper. It is disengenuous to claim that he is dismissive of business owners, business startups, and the hard work of entrepreneurs. Solutions are not reached when people disregard the facts to blow up bias and bigotry to further their own purposes, and that is what has happened with this issue.I am respectful of those who drive themselves to success, but I agree totally with the President. No matter how hard any one individual works, the environment for success in the US is part of that success. If you don’t think so, go start a business in another part of the world and compare business startup environments, governmental regulation, required bribes, payoffs, and tariffs. In other countries, it is true that bribes are often required to start a business. In America, things are completely different. The government here legally extorts money from you that far surpasses what the bribes are in other countries. Between the EPA, the health department, zoning regulators, building permits, bonds, licenses, approvals, fire inspections, OSHA, ADA, unions and every other damn person that stands between me an opening my business – I WOULD RATHER BRIBE SOMEONE TO MAKE IT GO AWAY! Obama has thrown EVEN MORE government officials with their hands out between me and making money. MY tax money built the roads. MY tax money built the infrastructure. MY tax money. Not government. The government stands between the builder and the taxpayer with their hand out taking their huge cut off the top of my tax money. Government didn’t build my business – I built it in spite of the government.